For generations, the noble Vladimirovich family has lived a difficult but peaceful life on the edge of a Russian forest. The family and the local villagers praise God in church on Sunday and leave offerings for the magical creatures who watch over their homes and stables throughout the week. Young Vasilisa Vladimirova has a peculiar gift, however, and secretly sees and talks with these friendly spirits. When a new, terrified, and fiercely devout stepmother and a captivating young priest arrive, they demand that the villagers stop their idol worship and abandon their traditional practices. Alone in her determination to honor the old ways, Vasilisa must defy both her place in society and the evil forces growing falsely in the name of Christ. Again and again over the past few months, I stumbled across starred reviews of The Bear and the Nightingale in major review journals. As a result, my expectations were extremely high. Luckily, when my hold finally came in I was captivated from page one. 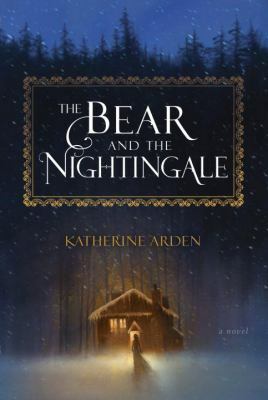 First time author Katherine Arden writes beautifully, creating vivid characters, an entrancing story, and a lush world based on Russian folklore. The second half of the novel reminded me in small, lovely ways of The Hero and the Crown or The Blue Sword by Robin McKinley, but in other ways it was utterly unique. Though aimed at an adult audience, The Bear and the Nightingale will appeal to teenagers as well. Just as a warning, however, it does feature dark creatures that gave this squeamish librarian the heebie-jeebies, so I wouldn’t recommend it for especially young readers. Overall, this is one of the best books I’ve read in a long while, and I’ll be recommending it left and right in the months to come. I haven't read something this good in a while; I really loved The Bear and the Nightingale! It's a beautifully written story that envelops the reader in a Russian fairy tale of old magic and new religion. The story takes a leisurely pace without getting boring, and it’s full of so much depth that it’s hard to describe what it’s about without giving too much away. Ultimately this book was wonderful, and I will be recommending it to people for a long time.